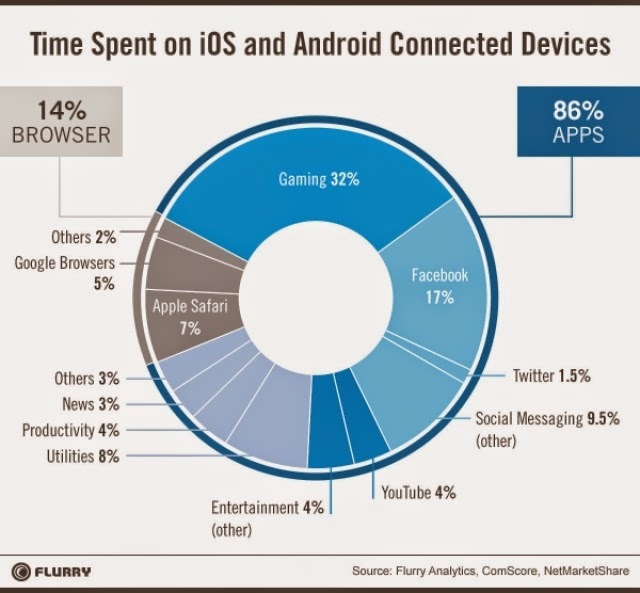 Analytics firm Flurry has published data on mobile usage by US consumers during Q1 2014. While users are spending more time on their devices (an average of 2 hours and 42 minutes per day, up four minutes on the same period last year), how they use that time has changed as well. Only 22 minutes per day are spent in the browser, with the balance of time focused on applications. I prefer native apps over some web service, web app or webpage any day. A dedicated native app OS faster, better at handle the specific content, and has a better user experience. That's also the reason why I don't believe in the ChromeBook. It will always be too limited, and the iPad beats it big time when it comes to productivity and creativity. All thanks to the awesome native apps.